Conveniently located at Panama City Beach Parkway, formerly known as Back Beach Road. Approximately 1/2 mile from the new "Fly Over" ramp on the East end of Business 98 Highway. 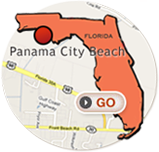 Find Map & Driving Directions to Ed's Sheds Mini Self-Storage Services in Panama City Beach, Florida.